If you are interested in vegetarian eating, you may be curious about mango fruit facts. Mangoes are a tropical fruit with flesh that is bright yellow to orange in color. They are generally very juicy and sweet when ripe and have a bit of an astringent flavor. Mangoes are a member of the sumac family and are related to cashew nuts and pistachios. They are one of the world's most popular fruits and make up a large percentage of the tropical fruits produced each year. In fact, mangoes are eaten by more people on a regular basis than are apples throughout the world. There are several varieties of mangoes, and they range in size and weight from an ounce or two to almost four pounds. Most commercially sold mangoes weigh approximately eight ounces and are four to five inches long. The mango tree can grow to a height of 65 feet. It produces shiny, pointed leaves between eight and 14 inches long. The mango tree is so beautiful it is valued not only for its fruit-bearing qualities but also as an ornamental and shade tree. Mango trees do not begin to produce fruit until four to six years after they are planted, but they can continue to bear fruit for up to 300 years. The wild mango is native to East Asia, specifically India and Burma. However, it is small and has a fibrous texture and turpentine flavor that bears almost no resemblance to the flavor of commercially cultivated mangoes. Mango cultivation began in India, where some believe the fruit has aphrodisiacal qualities. Grafting of mango trees began in the 16th century and is still used today, as cultivated mangoes will not always grow from seed and may revert back to their nearly inedible wild ancestry. The mango tree was mentioned in Sanskrit writings and is an integral part of an ancient story of everlasting love. According to the story, a great emperor fell madly in love with and married Surya Bai, who was the daughter of the Sun. In order to escape an evil sorceress, Surya was forced to transform herself into a golden lotus. When the king then fell in love with the beautiful flower, it was burned to ashes by the sorceress. The emperor was devastated until a majestic mango tree grew from the flower's ashes. Surya Bai emerged from a juicy, ripe mango that fell from the tree, and she and the king were reunited. 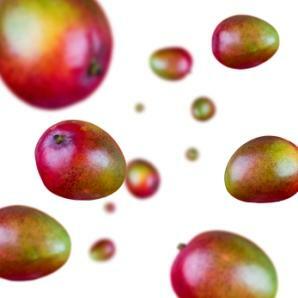 All fruits are vitamin-packed, and the mango is no exception, being a highly nutritious fruit. Mangoes are an excellent source of carotenes, important antioxidants. One cup of sliced fruit provides more than 180 percent of the recommended daily allowance for vitamin A, 60 percent for vitamin C, and 20 percent for the mineral copper. Mangoes are also a good source of B vitamins, vitamin E, magnesium, and potassium. Raw mangoes are comprised of nearly 90 percent water and are a good source of fiber. One cup of chopped raw mango contains about 110 calories. A ripe mango will yield slightly to gentle pressure and will give off a delightful, fruity fragrance. Squeeze the fruit gently. It should be solid but soft. An overly ripe mango will feel spongy. Avoid mangoes with shriveled skin. The skin of the mango should be smooth and relatively free of blemishes. Mangoes are harvested before they are fully ripe in order to withstand traveling long distances. Mangoes that are rock hard were likely picked too soon and will never ripen properly. Place slightly underripe mangoes in a paper bag along with an apple at room temperature for a few days. Once ripe, mangoes should be stored in a plastic bag in the refrigerator, where they will keep for several days. The mango is a delicious and fascinating fruit. As with most fruits and vegetables, exploring mango fruit facts is an interesting way to become more connected to the foods you love. Why not try a mango today?